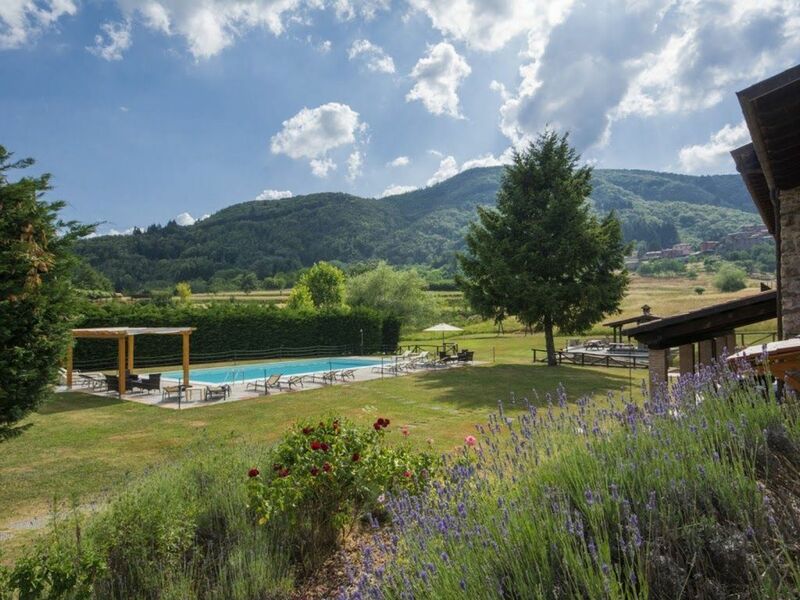 A beautifully renovated old barn set in 3 hectares of farmland, with amazing views over the unspoilt, green and mountainous countryside of Garfagnana, Northern Tuscany. The property is split into 2 apartments (only let together, and price includes both!) , giving larger groups privacy from each other, whilst staying together on holiday. La Casa has 4 bedrooms and 4 bathrooms and La Capanna, 4 bedrooms and 2 bathrooms, benefiting from the stunning chestnut beamed ceiling in the open plan living space. Both have fully equipped kitchen areas and open fireplaces. La Capanna enjoys a first floor terrace. Outside there is an eating terrace overlooking the pool area, and looking out to the mountains beyond. There is plenty of room for large groups to all eat together both inside and out, with a covered loggia, and a covered terrace, providing that all important stage. La Capanna has a large table that pulls out to accommodate all inside too. Why not try the wood over and make pizzas? The house is just 2 km from Camporgiano with its river, castle, small weekly market, restaurants, bars and shop. The village also boasts a train station for those days when you wish to leave the car behind, and visit the likes of Lucca; Barga; Castelnuovo; Pisa; Florence and the coast. The house/Garfagnana: A truly rural holiday, but with plenty of opportunity to explore. The property is situated circa 2 km from the nearest village, with plenty of facilities. You may also walk across the fields if you prefer for a leisurely lunch. The house boasts fantastic views of the unspoilt countryside whatever the time of year. Explore the hundreds of hilltop villages, go walking, horse-riding, bike riding, or try the fishing which is excellent. Of course the possibilities for picnics are endless and star gazing at night an experience. Relax with a glass of wine and watch locals play Bocce or be a spectator at the cheese rolling for which the area is famous. In the autumn join in the local passion of mushroom picking or feast on chestnuts which used to form the staple diet for the locals. Tourism is yet to hit this area and this is truly one of those increasingly rare places in Europe for which this can be said. Food: Garfagnanan cuisine is fairly simple, but scrumptious, using local fresh produce to prepare dishes, which since cooked for the locals are very cheap! Wine is good and inexpensive. There are numerous restaurants in the area and children are welcome. Provisions can easily be found in local bars/shops and supermarkets. The locals are very friendly and helpful although not many speak English, take your phrase book. That said, we have family in the area who will be pleased to help you with any translation issues. Location: Properties are circa 1 1/2 h drive from Pisa, 2 hrs from Genoa, 2 h Florence, and 2 1/2 h from Bologna. The local market town of Castelnuovo is circa 25 min drive away, famous for its Thursday morning market. A 2 or 3 min drive will take you to the village of Camporgiano which has all the facilities you will need and also a train station for when you want a rest from the car. The station serves Lucca/Pisa and also various seaside towns (with a change at Lucca). Lucca is under an hour by train/car and is an absolute must, as is Barga just half hour away. Two of the shower rooms are en suite . One part of the house has 4 bathrooms and the other, two. 2 living rooms and 2 dining rooms. 2 kitchens, so double of all facilities! Various dining options, inside and out and plenty of room for all to dine together. Our large family group spent a week at Collaprico in July. It was an amazing property with every amenity provided. Plenty of space and beds for 16 of us and everyone thoroughly enjoyed the week. Really enjoyed the large pool and the gorgeous gardens. Would highly recommend this property. Thank you for your review. Glad to here you found this an amazing place to stay and that you would highly recommend ! Gabriele would be happy to welcome you again. We were 4 family groups ranging from 1 year old to 70 years old. The property was ideal in that sense as we had the younger ones with children in 1 half and the elders in another. We thoroughly enjoyed our time there and the children loved the pool and the outside space. Easy to sightsee either driving or by train. Slightly remote (we expected that) with perhaps a 2km walk to the village.Easy going in - not so easy coming back. Nice Pizza restaurant in the village and a slightly more upmarket restaurant 5 mins drive away. I have to say the villa itself which was comfortable , clean and tidy is slightly tired particularly outside. Most of the wooden furniture needs repair. a 5 year old girl managed to collapse a chair whilst sitting with a book. The pool surround has many loose paving stones which was a slight worry when the children were playing. The villas are not particularly well equipped and many kitchen items were shuttled between the 2. A few large glasses would have been nice. Not major problems but annoying when trying to cook a large meal. The main picture showing the pool and fields beyond is several years out of date. There are 2 houses built fairly close and there is a 3 metre hedge (see picture). The owner and his mother were very helpful and overall I would recommend a stay here, but it could be improved fairly easily. Thank you for your review, and we are glad you had a good time at this beautiful place. You are right that the photos were rather old and we have now taken up to date photos which are now on the advert, with all old external photos removed. We have also undertaken a full review of kitchen equipment and the owner will update items that have been missing ready for 2018. He does do an update at the end of each season...The villa does have a regular programme of reinvestment and sunbeds will be part of that for 2018. Thank you and we hope to hear from you another time. We had a wonderful family holiday here, hiring both villas for a week in August for three family groups with babies, young children and grandparents. The setting was idyllic and felt quite remote, with a lovely large pool and terrace area facing the hills, and a large outdoor pizza oven that we used to cook homemade pizza for about 23 of us (including guests) one evening! There was plenty of shade along one side of the properties facing the pool (thanks goodness - it was hot!) , where we ate together for most of our meals, although there was a separate shaded terrace on an upper level for the villa we stayed in if we needed our own space. Some shade was also given on the main lawn by the large tree, great for hanging out under with the little ones. The swings in the adjacent field (a 30-second walk from the pizza oven) were an added bonus for the kids. There was plenty of space for us all in the villas and we had pretty much everything we needed. The owner, Gabriele, was nearby and ready to help if we needed anything. Via Tuscan Retreats, they also managed to find us three highchairs and three cots! Washing lines were available 'round the back' for drying the laundry, as well as airers which we used on the terrace. There was plenty of onsite parking for our three cars and getting around was straightforward, but we know the area as we have family living nearby. It was also nice to walk up through the fields to the little group of houses at via del Poggetto, and despite the heat, we also did the longer walk down to Camporgiano (and back up!). We would definitely recommend these villas for a large group of family and/or friends. Thank you for your review! We are glad to hear you had a good time, found the setting Idyllic, and that you enjoyed the countryside views! Always great to know that families are enjoying this beautiful place. A beautiful place off the beaten track. Near to station.we had all ages of family staying where it suited all. Owner very helpful and nothing too much problem. Pool was cold as not heated. Some of the younger members tried it and turned a bit blue! We would thoroughly recommend this for either family holiday or a pile of friends. Thank you for your review, and we are glad to hear you had a good time and enjoyed this beautiful property and would recommend it to others. As you say, it is great for a large group. Sorry the pool was cold - as you are aware we usually only open it from May onwards (and it was particularly cold before you arrived) but we opened it early for you and hoped for the best! Hopefully it was lovely to sit around even though you couldn't get in! Do think about coming another time later in season when weather is hot - Gabriele would be happy to have you! This place is great. We rented the whole lot & there's plenty of room to spread out in various shaded spots. The pool is excellent. There are plenty of places to visit (Lucca, marble mines, lakes, castles) although as the roads are winding, give yourself plenty of time to get anywhere. Good cycling terrain - if you like hills (try St Pellegrino in Alpe). There's a really good pizzeria in the centre of the village, and a visit to the Mulin del Rancone at the bottom of the valley is a must. Gabriele & his family are close by & are great help. 17 of us stayed in this lovely location for a walking holiday. There was adequate space for all of us and we had several meals together round the BBQ and the beautiful terrace facing the hills. Our walks were within easy car journeys and it was lovely to return and relax round the pool. Plenty of shade round the garden for those who find it too hot! We also loved Lucca and travel by rail. The local pizza restaurant in the village was excellent. The owner met us on arrival and was very friendly. Super place for a family get together or a group of friends. The property is set 2 km outside of the mediaeval village of Camporgiano which has a shop, bar, restaurants, train station, river, weekly market and a castle. The Garfagnana area is green, mountainous and entirely unspoilt. There are breathtaking views at every turn and hundreds of hill top villages to explore. The house is also circa 1 h from Lucca; 1 h 30 min from Pisa, 2 h from Florence; 1/2 h from Barga, and about 15 min from the market town of Castelnuovo famous for its Thursday market. NB - The Stay Tax of €1 per person per night, is applicable for a maximum of 5 nights and is payable in cash on arrival. Linen and towels included (except pool towels) All services included with exception of central heating .